SCVHistory.com AP1017 | Newhall | Historic Needham Ranch Structures, n.d. Structures on the Needham Ranch, n.d. (but before 1963). Identified in Maggi Perkins 2010. Henry Clay Needham (1851-1936), a prominent member of the Prohibition Party, came to town in 1888 from Kentucky (by way of Kansas) with the intention of establishing a dry colony here. He settled on a portion of the 10,000 acres that his colleagues had purchased one year earlier from the nascent Newhall Land and Farming Company. 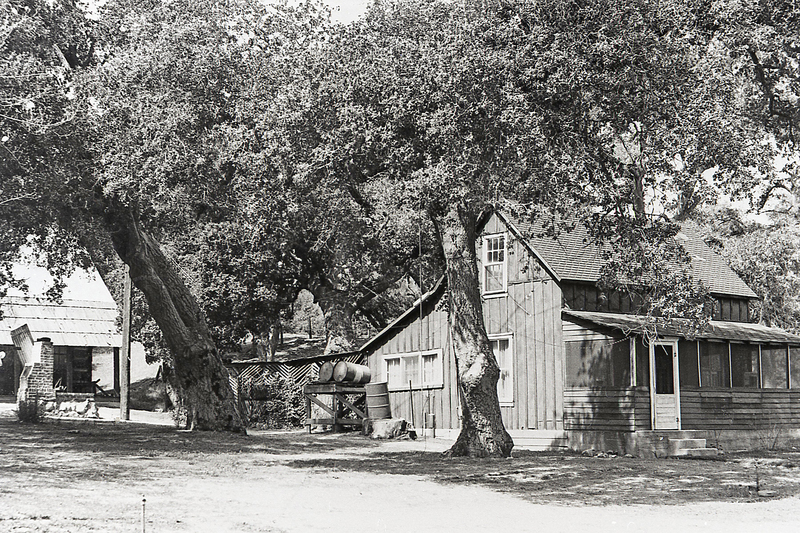 Needham's own section of approximately 770 acres was located southwest of today's intersection of Newhall Avenue and Sierra Highway — the modern location of Eternal Valley Cemetery and the Gate-King Industrial Park at Needham Ranch. In an oil-worker town where saloons outnumbered churches, the idea of a dry colony was doomed from the start. But Needham did get so far as to subdivide the 10,000 acres. Even today, his handiwork — the St. John Subdivision — appears in title reports for real estate in the Newhall area. One other lingering reminder of Needham's presence is the Newhall Water Company, which he established (or purchased from others, depending on the source) and sold to A.B. Perkins in 1920. The water company would morph into the Newhall County Water District, which ultimately merged with the Castaic Lake Water Agency to become the Santa Clarita Valley Water Agency. The entire upper floor of the ranch house was the sleeping quarters, a large loft partitioned by curtains for privacy. I was always a bit frightened sleeping there, although the beds were big and comfortable with clean sheets and wonderful quilts. But even a well-ventilated second floor got very hot in the summer months. For many years there was a privy in the back yard, a root cellar, and a cold cellar. ... Running water came only to the kitchen and to a wash basin. Cooking was done on a wood stove, and illumination was provided by kerosene lamps. No electricity reached the house until the early 1930s. Additional research is needed to determine the exact location of the Needham ranch house and outbuildings, which burned down in one of the huge wildfires of the 1960s — perhaps but not necessarly the 1962 fire that consumed Melody Ranch. In 1957, Needham's heirs sold the 770 acres to a man who held it only a short time before selling it (today we'd say he flipped it) to Mark Gates Sr. (1907-1972), a funeral director who wanted to establish his own cemetery. It was a logical place, because Needham's property included Newhall's Pioneer Cemetery on the old Sanford Lyon property. Gates carved out approximately 200 acres for his new Eternal Valley Cemetery, and the balance of the property remained in the family until Gates' son, Mark Gates Jr., developed part of it into an industrial park (construction commenced in 2017) and transfered an oak-studded, 240-acre riparian section to the city of Santa Clarita as permanent open space. AP1017: 9600 dpi jpeg from 35mm negative scanned by Stan Walker.